Sometimes I think that we, as teachers, are so eager to get to the answers that we do not devote sufficient time to developing the question. I think this latches onto the structure of the geometry course: we develop tool (A) to study concept (B). But curriculum can get too wrapped up in tool (A), losing sight of the very reason for its development. So we lay a hook by presenting concept (B) first. If Proof Is Aspirin, Then How Do You Create the Headache? This is too big for a blog post, obviously. If proof is the aspirin, then doubt is the headache. In school mathematics, proof can feel like a game full of contrived rules and fragile pieces. Each line of the proof must interlock with the others just so and the players must write each of them using tortured, unnatural syntax. The saddest aspect of this game of proof is that the outcome of the game is already known every time. Prove angle B is congruent to angle D.
Prove triangle BCD is congruent to triangle ACB. Decide if angle B and angle C are congruent. If they are, prove why they are. If they aren’t, prove why they aren’t. Prove line l and line m are parallel. Prove that corresponding angles are congruent. One of those proof prompts is not like the others. Its most important difference is that it leaves open the very question of its truth, where the other prompts leave no doubt. The need for certainty is the need to prove, to remove doubts. One’s certainty is achieved when one determines—by whatever means he or she deems appropriate— that an assertion is true. Truth alone, however, may not be the only need of an individual, who may also strive to explain why the assertion is true. So instead of giving students a series of theorems to prove about a rhombus (implicitly verifying in advance that those theorems are true) consider sowing doubt first. Consider giving each student a random rhombus, or asking your students to construct their own rhombus (if you have the time, patience, and capacity for heartache that activity would require). Invite them to measure all the segments and angles in their shapes. Do they notice anything? Have them compare their measurements with their neighbors’. Do they notice anything now? Now create a class list of conjectures. Interject your own, if necessary, so that the conjectures vary on two dimensions: true & false; easy to prove & hard to prove. “Diagonals intersect at perpendicular angles” is true, but not as easy to prove as “opposite sides are congruent,” which is also true. “A rhombus can never have four right angles” meanwhile is false and easy to disprove with a counterexample. “A rhombus can never have side lengths longer than 100 feet” is false but requires a different kind of disproof than a counterexample. With this cumulative list of conjectures, ask your students now to decide which of them are true and which of them are false. Ask your students to try to disprove each of them. Try to draw a rhombus, for example, even a sketch, where the diagonals don’t intersect at perpendicular angles. If they can’t draw a counterexample, then we need to prove why a counterexample is impossible, why the conjecture is in fact true. This approach accomplishes several important goals. It motivates proof. When I ask teachers about their rationale for teaching proof, I hear most often that it builds students’ skills in logic or that it trains students’ mind. (“I tell them, when you see lawyers on TV arguing in front of a judge, that’s a proof,” one teacher told me last week.) Forgive me. I’m not hopeful that our typical approach to proof accomplishes any of those transfer goals. I’m also unconvinced that lawyers (or even mathematicians) would persist in their professions if the core job requirement were working with two-column proofs. It allows students to familiarize themselves with formal vocabulary and with the proof act. Students I taught would struggle to prove that “opposite sides of a rhombus are congruent.” This is because they’re essentially reading a foreign language, but also because mathematical argumentation, even the informal kind, is a foreign act. Offering students the chance to prove trivial conjectures puts them in arm’s reach of the feeling of insight which all non-trivial proofs require. It makes proving easier. When students try to disprove conjectures by drawing lots of different rhombi, they stand a better chance of noticing the aspects of the rhombus that vary and don’t vary. They stand a better chance of noticing that they’re drawing an awful lot of isosceles triangles, for example, which may become an essential line in their formal proof. Resolving this list of conjectures about the rhombus – proving and disproving each of them – will take more than a single period. Not every proof needs this kind of treatment, certainly. But occasionally, and especially early on, we should help students understand why we bother with the proof act, why proof is the aspirin for a particular kind of headache. If that simplified form is aspirin, then how do we create the headache? BTW. For anybody not on board this “headache -> aspirin” thing, I want to clarify: totally fine. Thanks for contributing anyway. But please name your priors. Why that task instead of another? Some of these tasks you all suggest in the comments seem great and full of potential, but tasks aren’t generative of other tasks. I need fewer interesting tasks and more interesting theories about what make tasks tick. These kinds of theories, when properly beaten into shape, have the capacity to generate lots of other tasks. BTW. Scott Farrar chases this same idea along a different path. I think this latches onto the structure of the geometry course: we develop tool (A) to study concept (B). But curriculum can get too wrapped up in tool A losing sight of the very reason for its development. So, we lay a hook by presenting concept B first. We almost always do an always-sometimes-never to motivate a particular proof. Mine are usually teacher-generated (here’s a list of 5 statements about rhombi – tell me if they are always, sometimes, or never true). Then we prove the always and the never. Michael Paul Goldenberg and Michael Serra offer some very convincing criticism of the ideas in this post. If Graphing Linear Inequalities Is Aspirin, Then How Do You Create The Headache? 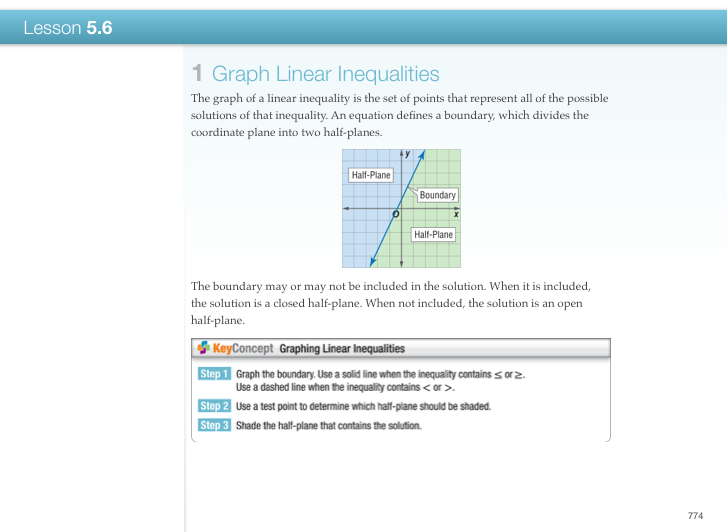 The graph of a linear inequality is the set of points that represent all of the possible solutions of that inequality. An equation defines a boundary, which divides the coordinate plane into two half-planes. This is mathematically correct, sure, but how many novices have you taught who would sit down and attempt to parse that expert language? Graph the boundary. Use a solid line when the inequality contains ≤ or ≥. Use a dashed line when the inequality contains < or >. 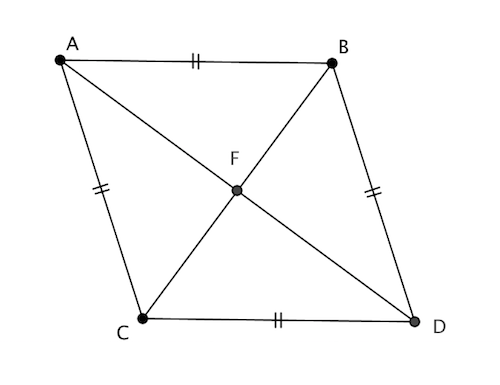 Use a test point to determine which half-plane should be shaded. Shade the half-plane that contains the solution. The text offers aspirin for a headache no one has felt. The shading of the half-plane emerges from nowhere. Up until now, students have represented solutions graphically by plotting points and graphing lines. This shading representation is new, and its motivation is opaque. The fact that the shading is more efficient than a particular alternative, that the shading was invented to save time, isn’t clear. My commenters save me the trouble. Ask students to find two numbers whose sum is less than or equal to ten (or, alternatively, points that satisfy your 2x + y < 5 above). The headache is caused by asking them to list ’em all. The aspirin is another way to communicate all of these points — the graph determined by the five steps listed above. Rather than present the steps, have students plot their points as a class. One problem I like is having each kid pick a point, then running it through a “test” like y > x2. They plot their point green or red depending on whether or not it passes the test — and a rough shape of the graph emerges. John Scammell writes about a similar approach. Nicole Paris offers the same idea, and adds hooks into later lessons in a unit. Great work, everybody. My only addition here is to connect all of these similar lessons with two larger themes of learning and motivation. One large theme in Algebra is our efforts to find solutions to questions about numbers. Another large theme is our efforts to represent those solutions as concisely and efficiently as possible. My commenters have each knowingly invited students to represent solutions using an existing inefficient representation, all to prepare them to use and appreciate the more efficient representation they can offer. They’re linking the new skill (graphing linear inequalities) to the old skill (plotting points) and the new representation (shading) to the old representation (points). They’re tying new knowledge to old, strengthening both, motivating the new in the process. Proofs. Triangle proofs. Proving trigonometric identities. If proof is aspirin, then how do you create the headache? Your Conference Session Is The Appetizer. The Internet Is The Main Dish. ISTE just wrapped. NCTM wrapped several months ago. What was accomplished? What can you remember of the sessions you attended? Will those sessions change your practice and in what ways? Zak Champagne, Mike Flynn, and I are all NCTM conference presenters and we were all concerned about the possibility that a) none of our participants did much with our sessions once they ended, b) lots of people who might benefit from our sessions (and whose questions and ideas might benefit us) weren’t in the room. Build a conference session so that it prefaces and provokes work that will be ongoing and online. To test out these solutions, we set up Shadow Con after hours at NCTM. We invited six presenters each to give a ten-minute talk. Their talk had to include a “call to action,” some kind of closing homework assignment that participants could accomplish when they went home. The speakers each committed to help participants with that homework on the session website we set up for that purpose. Then we watched and collected data. There were two major surprises, which we shared along with other findings with the NCTM president, president-elect, and executive director. Here is the five-page brief we shared with them. We’d all benefit from your feedback, I’m sure. I don’t expect an NCTM conference to provide in-depth professional development, but act more like a booster shot for my own learning. I have a different set of expectations about conferences and whether going to them with a team allows you to go back to your own contexts and continue to build connections there. Can we expect conferences and the internet to do that — to feed our local collaborations? I get a lot of ideas from #mtbos and from my various conversations and conferences. But really making sense of those ideas takes another level of experience.